I remember the first time I went turkey hunting with my good friend Bill on a parcel of land he had permission to hunt. We met at a gas station a few miles from the property where he pulled out a paper sketch of the property and valiantly attempted to show me the details of the tract. I must admit, it was like trying to decipher Russian spy code. When we set foot on the property, the map might as well have been used to build a fire, as it did nothing but confuse us. I told Bill that if we were ever going to hunt together again on a new property, that I was going to print out a quality aerial map beforehand. After pulling the briars out of his hands and chugging two bottled waters from near dehydration, he enthusiastically agreed with my plan. I do not proclaim to be a mapping genius. I do not work for a government mapping agency and did not receive a degree in surveying. However, for the applications that most hunters and wildlife managers use, those certifications are simply not necessary. 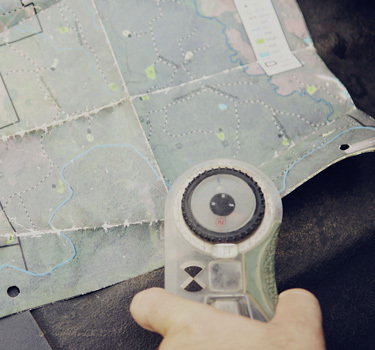 Mapping technology has evolved tremendously over the past ten years, and the “average Joe” now has more than a few options to obtain quality, up to date, and easy to produce aerial and topographical maps. By now many of you have probably heard about the monster known as Google. Google is a mega search-engine site that also offers a “maps” search console that I have found to be very beneficial. The main selling point of using Google to search for maps is that it is fast, easy, and best of all, free. I have found recently that more parts of the country are “covered,” in that the maps are high quality colored aerial maps. The main con to me is that you cannot save the Google produced maps to your computer without being a tech wiz. You can, however, print them out very easily, which is crucial if you are in a hurry on opening day. Bing.com is almost identical to Google in that it is a search engine site that happens to have mapping features. The pros are pretty much the same as Google, except for one really neat feature that Bing has. In certain places, you can get “Bird’s Eye View,” which is literally what it states. I was floored the first time I saw it! It really gives you a glimpse as to what the future may hold for mapping. The negative with Bird’s Eye View is that the coverage areas are few and far between, and you cannot map large parcels of land on the same sheet. For forty acre tracts or micro-scouting, it is perfect. MapCard.com is a membership site that allows you to search, save, and print an unlimited number of high quality aerial and topo maps. Standard packages start at around twenty dollars, and the MapCard Pro package runs closer to thirty. My favorite feature of MapCard is undoubtedly the Hybrid TopoPhoto feature, which overlays lines of elevation on a high quality aerial photograph. For hunters and land managers alike, a hybrid aerial has a multitude of uses from locating funnels to designing food plot or lake sites. Visit www.mapcard.com for more information. The numbers of software-based mapping systems are limitless. I could devote an entire article to those alone. One mid-range software system that I have had some experience with is DeLorme’s XMap program. It is basically a step up from MapCard, and enables you to draw property lines and measure off acreage. It is based on GIS principles, which make the maps very active and interactive. The cons with XMap are the cost, which can run upwards of $300, and the fact that the maps get outdated fairly quickly, requiring you to buy new discs every so often. However, for someone who really wants to ramp up their mapping capabilities, XMap is a very good place to start. Visit www.delorme.com for more information. Many people do not realize that they can obtain high quality area maps through local mapping services, both private and government funded. There are a number of flying services in my area that take photos for their clients. The obvious advantage is that the maps are clear and up to date. They usually run around a hundred dollars per property, but they can produce you some very high quality, laminated aerial maps. Most companies will save your maps to a disk, enabling you to use the data at your discretion. If you are unable to find an aerial service in your hometown, contact a local forestry or land management group to see if they know someone that could assist you. They lean heavily on aerial services due to the current information they can obtain. As far as government agencies are concerned, the NRCS office in your county is a great place to start. They normally keep an extensive catalog of aerial, topographical, and soil maps from the county, from which copies can be ordered for next to nothing. Having three different classes of maps for your property can do nothing but help you in managing it more efficiently. The drawback with using NRCS is that some of the aerial maps may not be as current as you may like. For more information, visit www.nrcs.usda.gov. As you can tell by now, maps are readily available through a number of avenues. A person simply needs to identify what uses they want the maps for. I personally like very current aerial photographs that have been laminated. I buy several copies of them and use each of them for a different task, (for example, I will mark my stand sites on one map, planting program on another, etc.). For the weekend warrior, however, a Google or Bing.com derived map may be sufficient. It all comes down to priorities. The mapping industry is constantly changing, with more options emerging on a seemingly daily basis. This article was not intended to be an exhaustive review of the available services, but more so a “tip of the iceberg” introduction to the world of mapping. I encourage you to lean heavily on maps this upcoming season. You will be amazed at their ability to make you a better hunter or land manager!